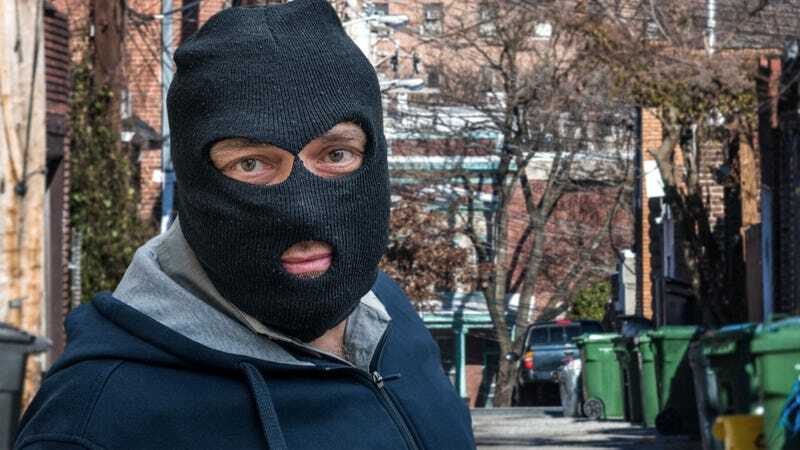 ABINGTON, PA—Frustrated that his local police precinct was shirking responsibilities, a masked vigilante confirmed Thursday that he would be taking the work of terrorizing the black community into his own hands as long as law enforcement officers failed to do so. “It’s become crystal clear that our police won’t do their duty, so it’s up to me to set things right by fulfilling the function of law and enforcement and making these streets unsafe for the so-called ‘black community,’” the vigilante told passersby from underneath a ski mask, elaborating at length how he could no longer sit idly by while his hometown became a place where white people became a minority in their own country and decent folk can’t even go into the library without seeing members of other races. “Thanks to the cops deciding that black people simply walking down the street aren’t worth their attention, I hardly even recognize my own home town. Why don’t the police do their jobs and stop and frisk all these black people? I guess it falls on my own two shoulders to get the community back on track.” At press time, law enforcement officials had arrested several victims of the masked vigilante.